I first heard about Infectious when I went to an event at IDEO in 2008 when my company, Ideacodes, had just started working with them on their new website. Infectious had a car displayed out front covered with decals by Dalek, one of my favorite artists. I loved the art and idea and made a mental note to look them up and see if you could submit art to be made into decals. Sure enough, I discovered that Infectious not only creates car decals, but also wall adhesives, iPhone, iPod, and laptop adhesives. Designs are first selected by the team at Infectious, then chosen for production based on community voting and feedback. Once selected, voting is open for two weeks. Fast forward to this weekend, I finally sat down and spent some time working through my ideas and created a design to submit. I was elated to wake up to a congratulatory email from Infectious that my design for a laptop skin had been accepted and entered voting! I’ve often thought about starting my own product line of gadget or fashion accessories or art toys and this seems like a great way to experiment. Plus, Infectious is a great company/concept that provides a backbone and an outlet for artists and designers. Every artist receives a percentage of the profits and retains ownership of their art. The design itself is a part of a series of personal work that I’m doing. While there are so many gorgeous adhesive skins out there, a lot of them are highly illustrative or occasionally photographic. 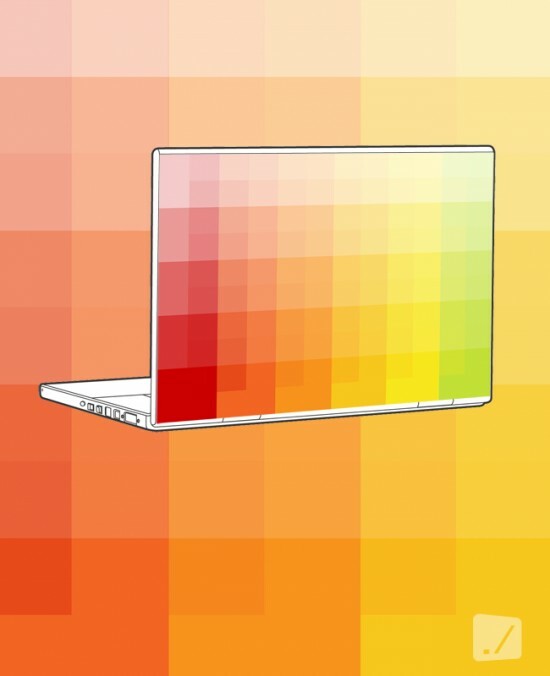 I’m drawn to color, minimalism, optical illusion and digital pixelation. So this is the kind of laptop skin I would want :) I plan to continue the line and do some iPhone/iPod adhesives as well. I’m also working on some new illustrations for some wall and car decals. Got my vote. Thanks for sharing. Somehow the citrus colors, which we’re used to seeing rounded and unsymmetrical, mixed with the Pixel design, really grabs the eye. It’s like the digital world mixing with the analog, organic world subconsciously. Really cool. I think I’d appreciate it more if I wasn’t colorblind. Stephen’s comment seems pretty dang insightful, though!